The coffee-plant is a shrub that belongs to about go kinds of coffea’s genus, among which the most renowned one is “Coffea Arabica” that gives the best fruits and is the most cultivated one. The plant has a trunk with primary and secondary branches and light green lanceolate oval leaves. The white flowers are concentrated and they rise near the armpit of the leaf, several blooms take place in a year. After the bloom, lasting two days, fruits come, at first they are yellow-green and then, after few months, they ripen until they become shiny-red berries. Two seeds are hidden in the pulp, they are equal, convex at the outside, flat at the inside. The botanical knowledge of the plant as well as the knowledge of coffee bean varieties and features, development and liberalisation of the coffee market, universal products and a growing number of people consuming this product have certainly contributed to the massive distribution of coffee plantations in different countries all over the world over the last few centuries. There are at least 70 plantations in the area close to the equator and in the tropics, in particular in Central and South America, Africa and Asia. Different agricultural areas were used to set up huge plantations there. Coffee cultivation can be divided into the following steps: dissemination of selected beans, cultivation of delicate plants in seedling nurseries and greenhouses in the first year, transplanting them after one year to their final place, subsequent fertilisation and carefully cutting back the plant to make it grow better. 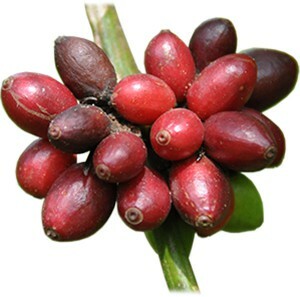 The blossoming cycle, the fruiting of coffee cherries with their red colour as well as their harvest are all activities which are performed in the production countries. The production of seeds either occurs through the dry process or the washing process. For the dry process, the fruits are harvested and dried in a big hall; once they are dry, they are comminuted and cleaned. If the washing process (in a water bath) is used, at first the fruit pip is mechanically removed, then the seeds are washed in a water bath where they are cleaned once again; then, the fruits may ferment for a short time before they finally dry under the sun in the open air. The washed coffee obtained through humidity has a higher quality, is select and may contain more flavouring which develops during the roasting process. At the end, coffee beans are selected, separated and classified depending on their sizes, colours, quality and defects.